Nicknamed “Iron Tigran”, Tigran Petrosian was a Grandmaster and World Chess Champion from 1963-1969. The foremost leader of using the rock solid defensive style, he focused on safety compared to reckless attacks that other players were well known for. A master of the positional exchange sacrifice, Petrosian used this idea multiple times throughout his career in order to flip the tables against his opponents. Combined with all the opening theory that he originated, Petrosian left behind a strong memory of his play and career, one that will remembered for all time. Tigran Petrosian learned to play chess at the age of 8. He became an orphan during World War II and started to use his time in order to get better at chess. 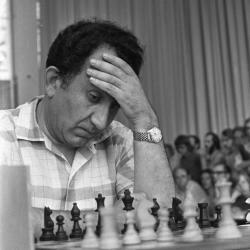 From reading books and learning from the teachings of Aaron Nimzowitsch, Petrosian started using solid positional openings which helped to influence his overall playing style as well. In 1946 he became a Candidate Master, in 1951 an International Master and in 1953 a Grandmaster. A decade later, in 1963, he won the World Championship against Mikhail Botvinnik. He followed this up with playing Boris Spassky in two more world championship matches, in 1966 (Petrosian won) and 1969 (Spassky won). It was after this second world championship match against Spassky that Petrosian lost his World Champion title. Throughout his life Petrosian played in many different Chess Olympiads, 129 games total, helping his team to win nine gold medals, one silver medal and six individual gold medals. Petrosian ended up passing away on August 13, 1984.